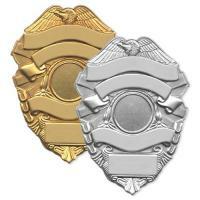 Blackinton B2167 Breast Eagle Badge with Panels - B2167 - 3" x 2 1/4"
Home > Blackinton > Police Badges > Badges with Eagles > B2167 Breast Eagle Badge with Panels - B2167 - 3" x 2 1/4"
B2167 Breast Eagle Badge with Panels - B2167 - 3" x 2 1/4"
Blackinton B2167 is a lovely unique oval shaped shield with a breast eagle, scrolled panels, and ribboned trim. You may personalize each of the four graceful panels with your rank and department information, then select the appropriate seal for the provided center area. Style B2167 measures 3" x 2.25" and is available in either gold or silver cast metal. You will most certainly wear this beautiful item proudly especially knowing that it was made with pride in the United States of America. Please allow four to six weeks for customization and delivery of your order. ©2002-2019 CopsPlus.com: Blackinton B2167 Breast Eagle Badge with Panels - B2167 - 3" x 2 1/4"